The goal of this newsletter is to provide you with enough information to be useful, but not more than can be learned within the busy schedule of a health care worker. You’ll find anatomy charts, additional vocabulary, occasional feedback from subscribers, and more! Feel free to read them now and save them for later use such as with a patient or as a study guide for coursework. Normal position: The normal curvatures of the spine include an outward kyphotic curvature in the thoracic and sacral regions and an inward lordotic curvature of the lumbar and cervical regions, all within a completely vertical spine. Scoliosis: lateral deviation of the spine. Kyphosis or hyperkyphosis: Abnormally excessive kyphotic curvature of the spine as it occurs in the thoracic and sacral regions. Can result from arthritis, developmental problems, osteoporosis with compression fractures of the vertebra, etc. Lordosis or hyperlordosis: An excessive curvature of the lordotic regions, most commonly seen in the lower back. Some causes include imbalances in muscle strength and length, such as weak hamstrings or tight hip flexors, achondroplasia, spondylolisthesis, osteoporosis, and pregnancy, among others. Posición normal: Las curvaturas normales de la columna vertebral incluyen una curvatura cifótica hacia afuera en las regiones torácica y sacra y una curvatura lordótica hacia adentro de las regiones lumbar y cervical, todo dentro de una columna vertebral completamente vertical. Escoliosis: desviación lateral de la columna. 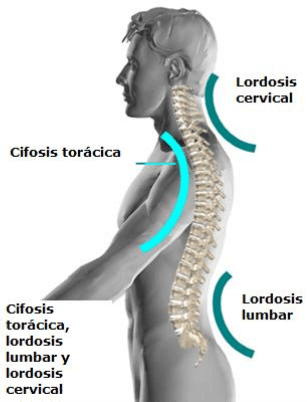 Cifosis o hipercifosis: Curvatura cifótica anormalmente excesiva de la columna vertebral, como se produce en las regiones torácica y sacra. Puede ser resultado de la artritis, problemas del desarrollo, la osteoporosis con fracturas por compresión de las vértebras, etc. 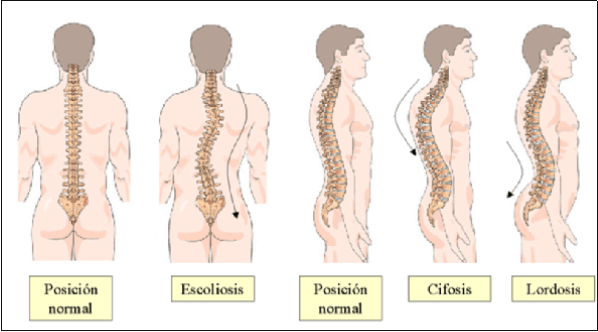 Lordosis o hiperlordodsis: Una curvatura excesiva de las regiones lordóticas, observada más comúnmente en la espalda baja. Algunas causas incluyen desequilibrios en la fuerza y la longitud muscular, como músculos isquiotibiales débiles o flexores de la cadera contraidos, acondroplasia, espondilolistesis, osteoporosis, y el embarazo, entre otros. For quick reference in the ward. Part of Health Care Spanish’s mission is to create a useful resource for health care workers. However, there is only so much that can be done without feedback from you. Email questions or suggestions to robert@pacificmedicaltraining.com. Tell us if there is a topic you want us to cover or a resource we can add to the site. Have an idea for a new CME course related to healthcare Spanish? Let us know!